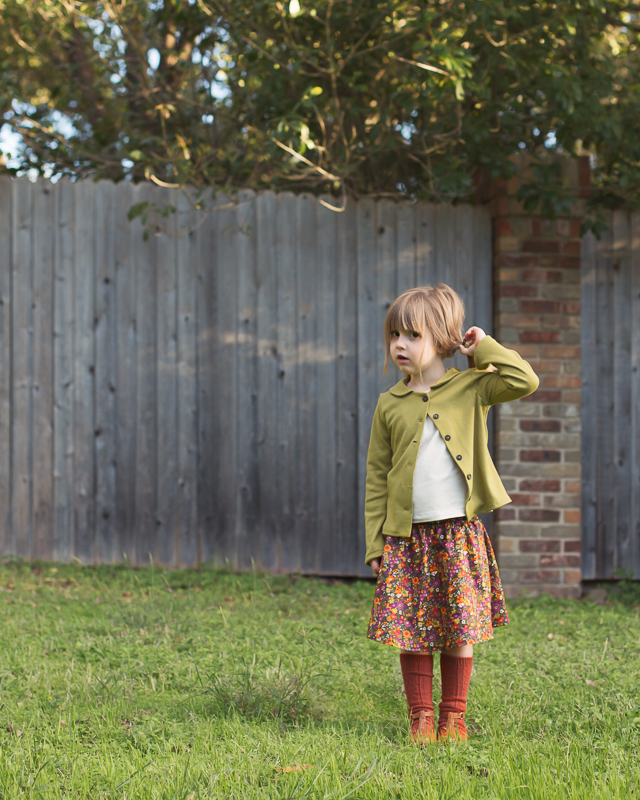 A couple of week ago, I shared my plans for the Oliver + S Swingset Skirt. And after several late nights of sewing, I completed the outfit I set out to create. 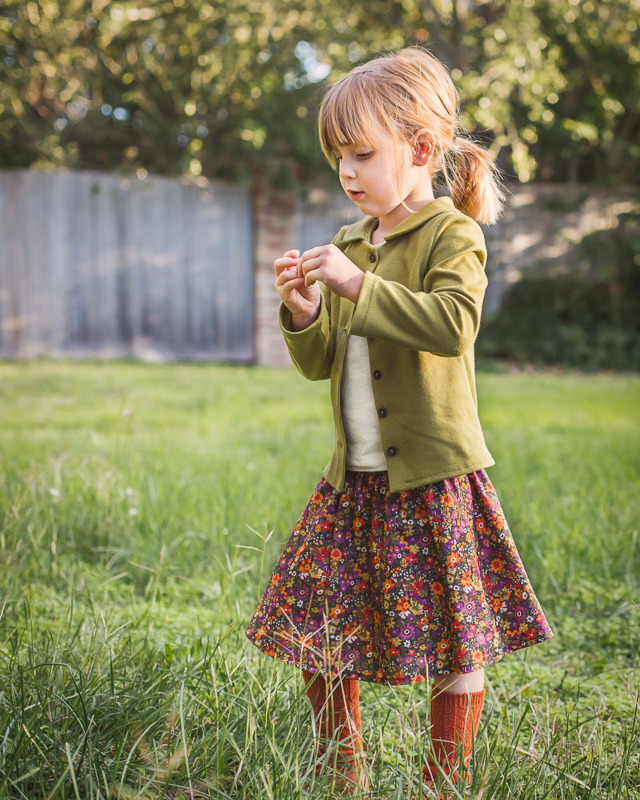 The Swingset Skirt is a simple and fast pattern. It would have been even faster had I not sewn the right side of my skirt front to the wrong side of my skirt back while burning the midnight oil. My lights were dim enough that I didn't realize I had made a mistake and kept right on going with the next few pattern steps. The next day, in the morning light, when looking closely I realized I had made a mistake. The difference between the right and wrong side of this fabric is so subtle, but I knew it would bother me. And this Liberty of London lawn is so special. So after finishing the skirt and trimming the seam allowance, I unpicked the whole thing and started again. And it was still a reasonably fast sew. 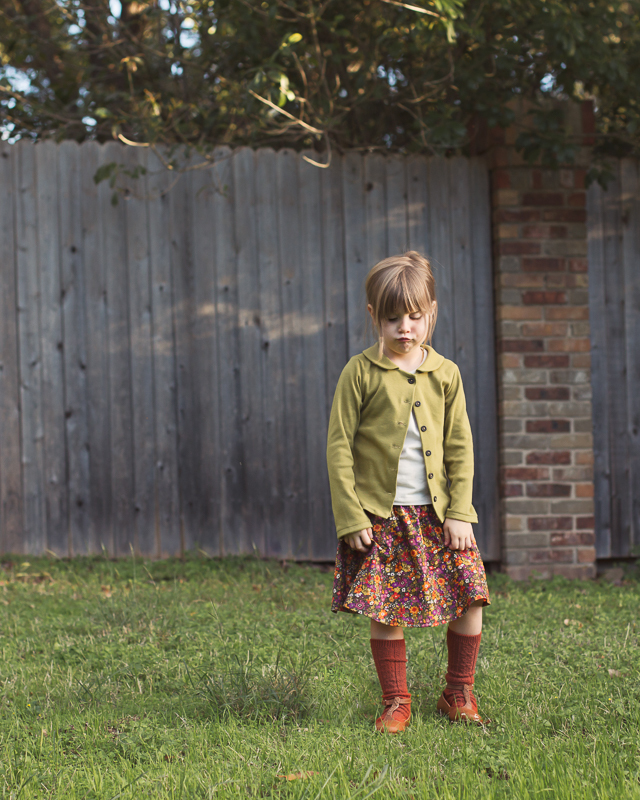 I knew from the get-go that I wanted to pair this skirt with an Ottobre sleeveless top - #28 in the 3/2014 issue. It's the same one I made for Indigo here. 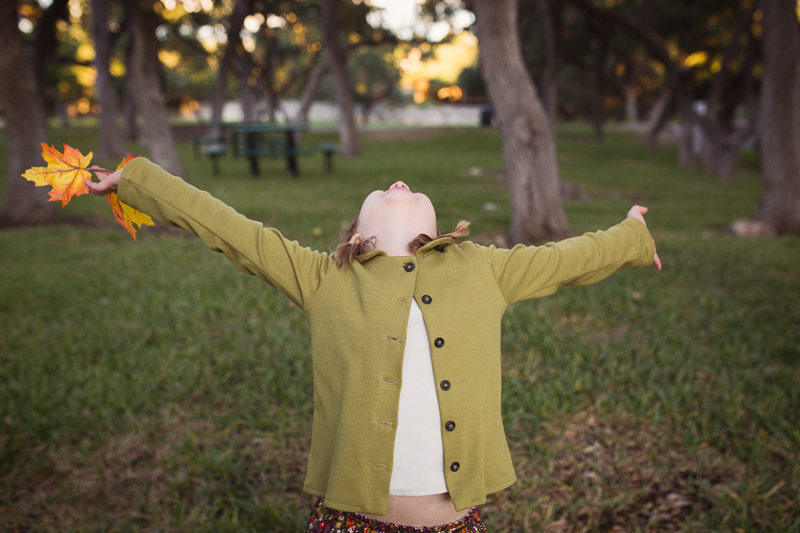 I also knew I wanted to make an Ottobre cardigan that's been on my to-make list since last winter. 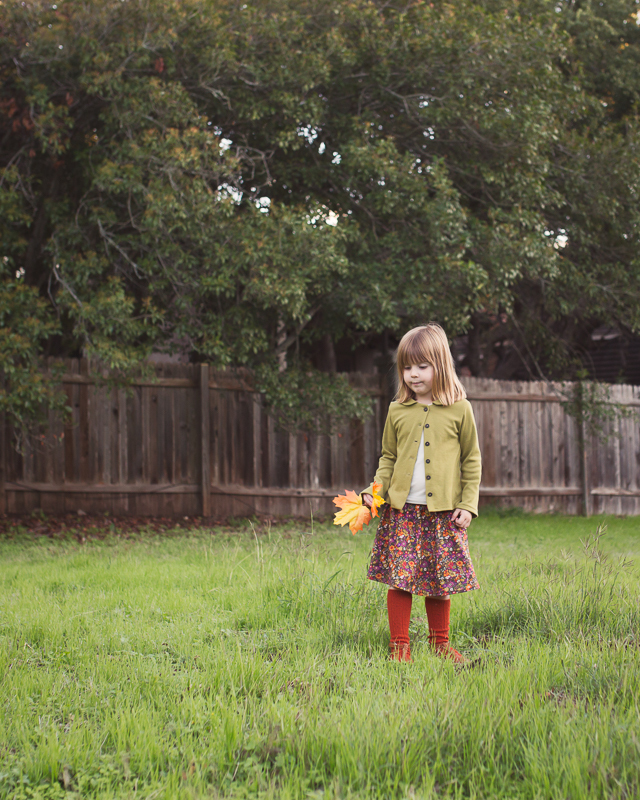 It's pattern #20 from the 6/2013 Winter issue. That issue of Ottobre may just be my favorite. I pretty much want to sew everything in it! I was a little afraid to sew the buttonholes on the cardigan, because I had never sewn buttonholes on knit fabric before. My machine is iffy on buttonholes as it is, so knit buttonholes seemed like a recipe for disaster. But actually, it went great. Even better than regular buttonholes, in fact. I just changed the setting on my machine to the knit buttonhole setting. One thing I almost never do with my kids is force them to take photos. I love photography and I love unposed shots so I normally wait until they are in the mood and are excited about a new outfit, if the photos are for my blog. Then I direct as little as possible. 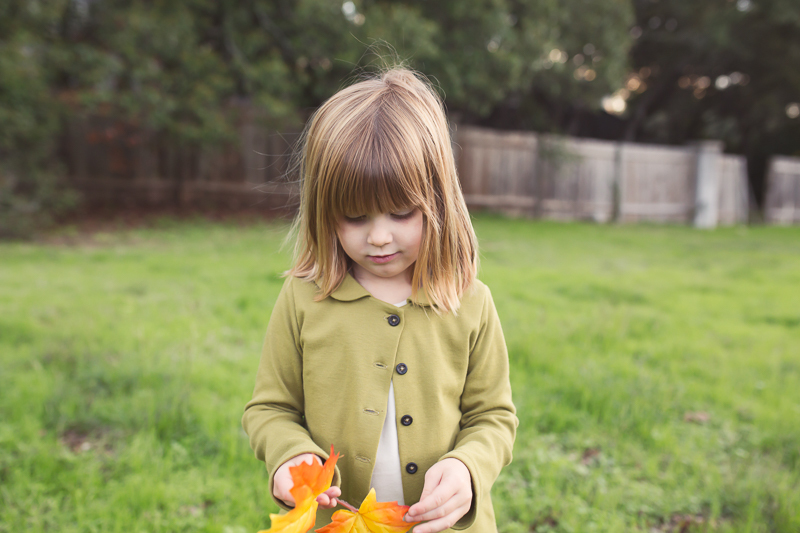 My kids generally love to have their photos taken and often ask me to take their pictures. 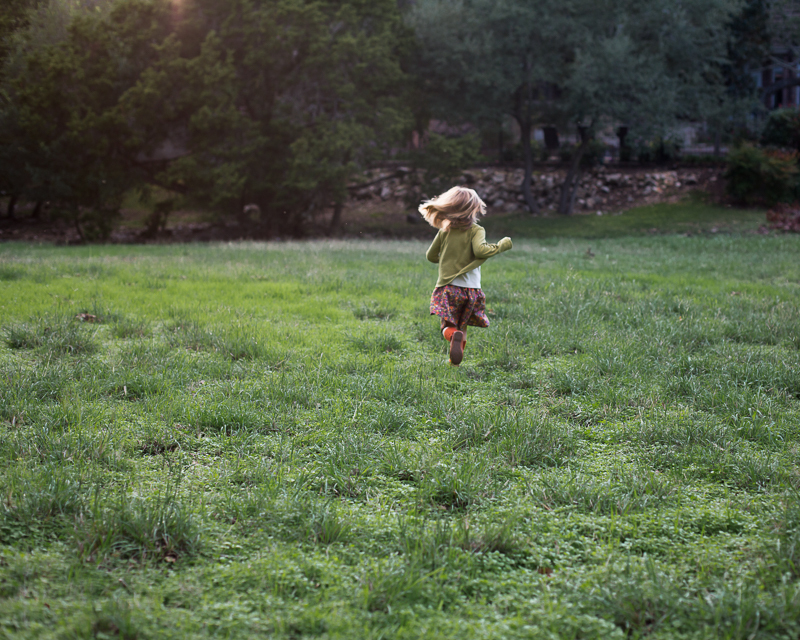 But this time, I had a deadline for the Oliver + S blog, so I had to ask Iris to take some photos. You can see how she felt about it. Immediately sensing an opportunity for a power struggle, she looked at me and said she did not want to wear her hair in a ponytail! And just how would I feel if she took it out?! I told her it didn't bother me at all. So she let her hair down and I let her be wild and free and everything was right in her world once again. I'm really glad I had the opportunity to sew this skirt pattern. It's such a good one. You can see what the other Swingset skirt panelists made here. Their skirts are so great! If you participated in the sewalong, don't forget to link up your skirt for the chance to win $100 to spend on the Oliver + S website. This is such a great outfit! Great job Rachel! she is adorable! that fabric...ahhhh! such beautiful fall colors. i love it. you always style everything so beautifully! Thanks for all of the inspiration, Gail! Your Swingset skirts are spectacular! Lovely outfit, and that is a really nice style of cardigan. Will make a note of that Ottobre edition! I don't think you will be disappointed. There are so many great options and so many basics, too! Looks so great on her :) I totally understand your issue with Liberty - I've done that before as well. It was so obvious to me yet no one else noticed (I ended up redoing the whole piece after it was finished). Ottobre are a perfect source of basic patterns. Ottobre 6/2013 is also one of my favorites. You're right - Ottobre is so great for the basics! Also, so glad to see you in IG! 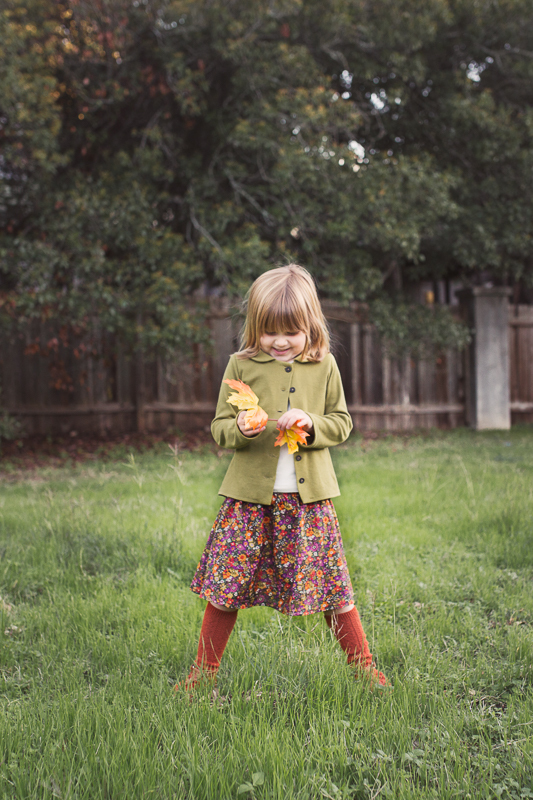 Such a perfect skirt for fall! Love this whole outfit. This outfit is just wonderful!! So autumnal and lovely. That Liberty! Droooool. And that special shade of puce green - it's one of my favorites!! (Seriously, up there with mustard yellow!) I love Iris too, even her grumpy face is completely adorable, and the photo of her running away, hair streaming behind her (she has a great head of hair! ), is perfect. These wild fairy children! That is a really great issue of Ottobre! I want to make so many items from it as well!! 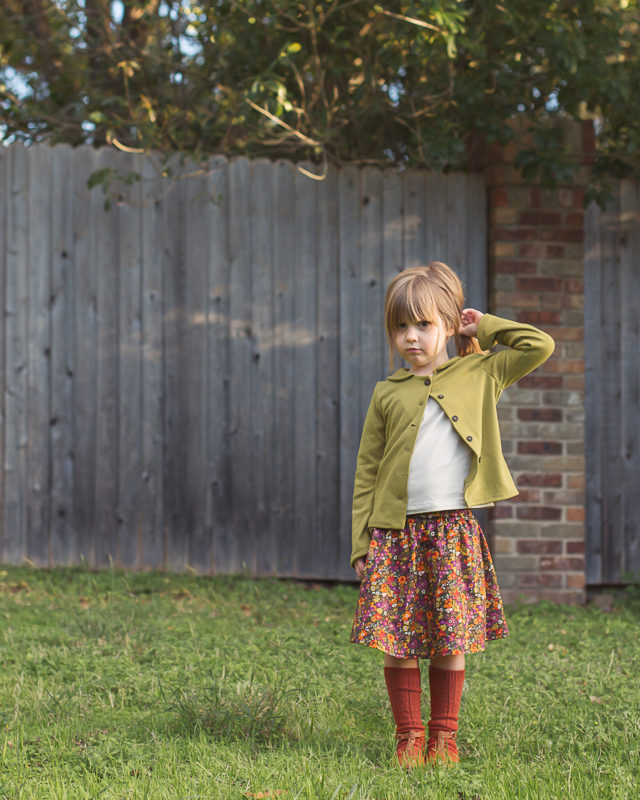 That cardigan is adorable - adding that to my list! If only all power struggles could be solved so easily! Go Iris! This is a gorgeous outfit Rachel, well done. It's a great outfit. 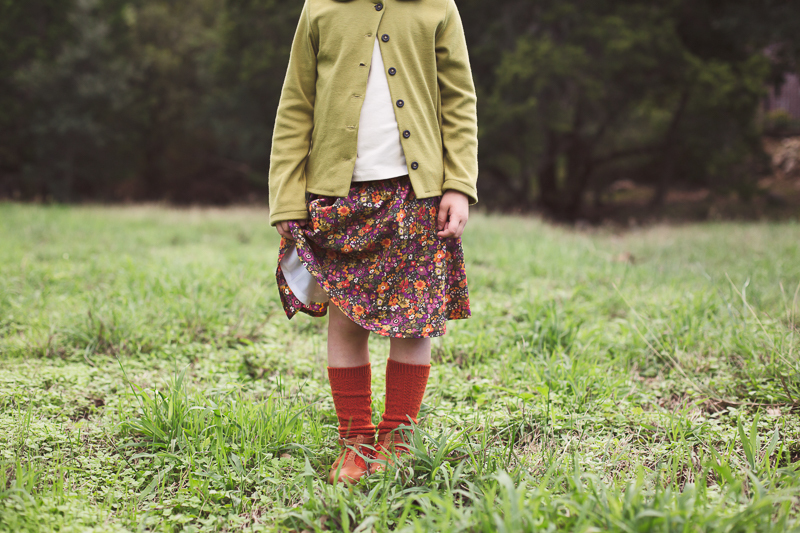 The skirt fabric is beautiful and I love everything about the cardigan - the collar, the shape and the color. It's a perfect compliment. 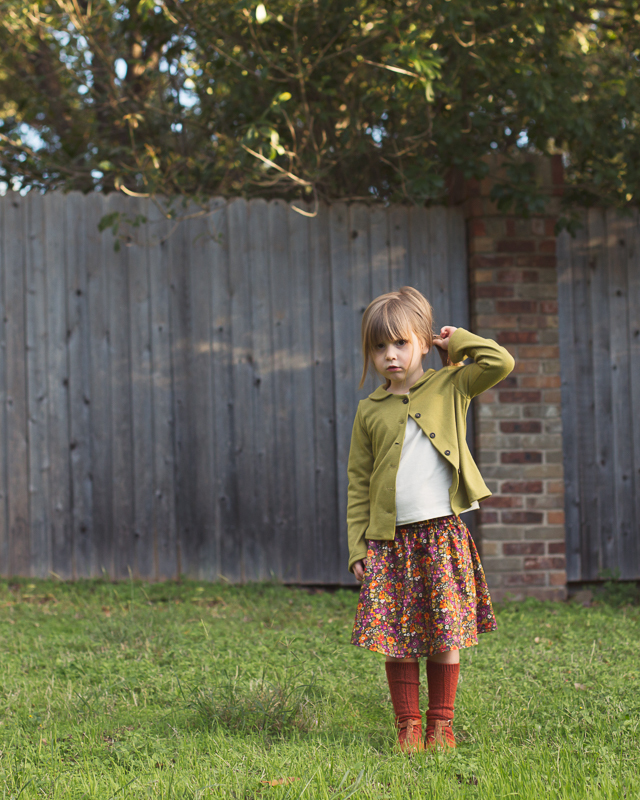 Oh, I forgot to ask you - what fabric did you use for the cardigan and how do you like it? I'm always interested in knit fabric reviews. oh, the look on her face in the "what would you do if I took my ponytail out" photo?! So good, Rachel:) I adore this ensemble, as it's the perfect combo of O & S along with Ottobre. Sorry about your sewing mishaps - I'm seriously impressed that you undid all your work.I think I may have been tempted to have thrown in the towel at that point. Well worth the effort though, as the result is so amazing! Tempted to thrown in the towel? For sure! :D I was totally tempted. :P Thank you, Lucinda! I have bit the bullet and subscribed to your blog. I don't usually do that (tiny email storage blah blah) but I did for Inder ( and a few others ) and I love it! Thank you, Nicole! I totally get it with inbox overload. My favorite way to follow blogs is by using Feedly. I have the app on my phone. Have you heard of it? You subscribed to blogs and you can check all of your favorite blogs in one place, when you have time. I usually check when I'm nursing Hazel to sleep. When you've read a post, the post will disappear from your feed. I love it. Also, I know a lot of people like BlogLovin which is similar. :) I'm really honored you've chosen to follow along!